With a third SBU, we are beginning to approximate the complexity of many Enterprises today. We have also replaced the SBU monikers with representative names of Finance, IT and HR. Essentially we are showing that a large proportion of How the PBUs do what they do, is done by IT. We are also showing that a large proportion of How Finance and HR do what they do, is also done by IT. Given these percentages we can work out How each of the BUs contributes to doing the work necessary for the Enterprise. ¨ PBU1 is responsible for 12% of the How. ¨ PBU2 is responsible for 10% of the How. ¨ Finance is responsible for 14% of the How. ¨ ITops is responsible for 60% of the How. ¨ HR is responsible for 4% of the How. These percentages are not a reflection of the “importance” of each BU, nor do they reflect how much each BU contributes financially to the bottom line, however it is an important way to look at which areas do the most work. If ITops is doing 60% of the How, why would an Enterprises deem it to be a Cost centre rather than a Profit centre? In a world before IT, no BU grew so much to completely dwarf other BUs because if it did, it is likely that it would have been divided up into more manageable PBUs or SBUs. When IT first began to be used by Enterprises, the IT BU was only responsible for a very low percentage of the overall How. As time has gone by, the use of IT has grown and grown. More and more of the How was taken out of the BU where that work is done and wrapped up in IT systems. In many Enterprises this has now grown to such a point that in the example shown above where ITops is responsible for 60% of the How. So, IT is a special case, but not because it’s IT. IT is a special case because it is responsible for the majority of the How of an Enterprise. Does the Leadership of your Enterprise understand how much IT contributes to the bottom line? Does your Enterprise treat IT Operations as a cost centre or a revenue stream? What percentages would apply to your Enterprise? 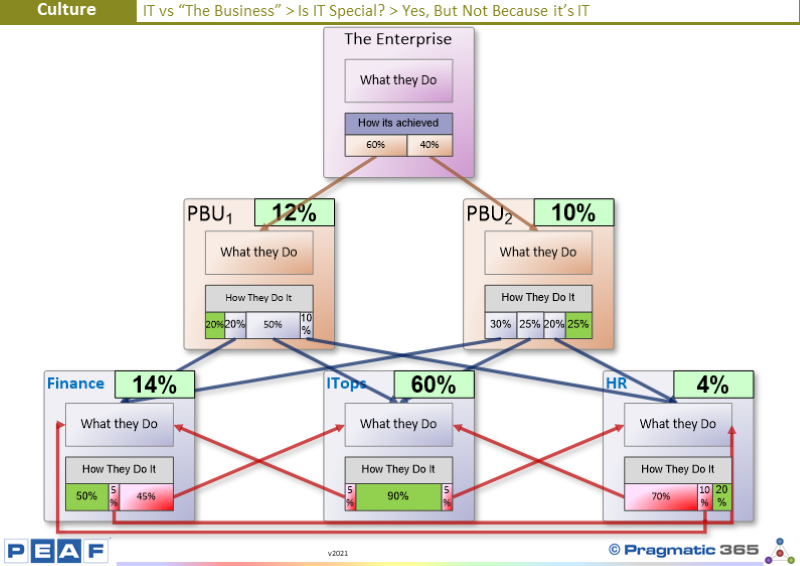 Which PBU or SBU is responsible for most of the “How they do it” of your Enterprise?